“Food”! A super-powerful word that can be linked to many attributes at one single time — emotional, physical, economic, environmental and ecological. According to Dr. Mark Hyman, the founder of The Institute for Functional Medicine, “our most powerful tool to reverse the global epidemic of chronic disease, heal the environment, reform politics, and revive economies, is the fork.” And it’s totally up to us what we put on it and bring to our mouth. I feel fortunate to have been associated with food throughout my life, in one way or the other. I started my career teaching nutrition to home economics students. After obtaining a Ph.D. in clinical nutrition, I continued pursuing my research to find the associations of food with many forms of degenerative diseases like atherosclerosis and prostate cancer. After many years of working in classrooms and laboratories, I felt the urge to work at a personal level, extending my nutrition knowledge to the community. But what would be the best way to go about educating the community, other than making healthy food and promoting their health benefits? 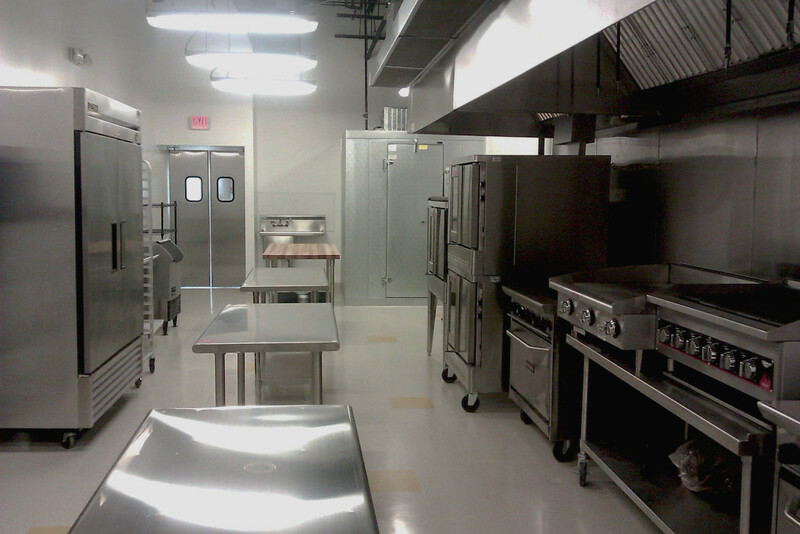 Community kitchens, such as those at SAAGE Culinary Studio in suburban Chicago, provide startup food companies with the commercial-grade equipment they need to make their products, enabling them to defer big capital expenses until they get their businesses up and running. Photo provided by SAAGE Culinary Kitchen. 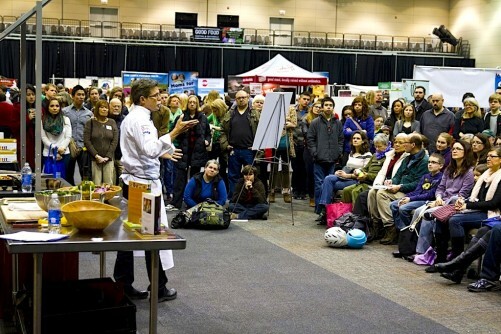 And to advance our mission, SAAGE Culinary Studio will be taking part, as a Good Food Court vendor, in FamilyFarmed’s 12th annual Good Food Festival & Conference, which takes place in Chicago from March 24 to 26. I had the opportunity to meet with Jim Slama, the president and founder of FamilyFarmed, in Whole Foods Market Naperville in 2010, where I was attending their Sunday Market as a vendor. During our little chat, I could feel that Jim was totally dedicated to the Good Food movement and to moving the nation toward the goal of a healthier food system that is more environmentally and financially sustainable. It was a very enlightened conversation. I attended the Good Food Festival the past few years. Every year I have seen the increasing number of new food businesses joining in this event, which brings together farmers, producers, entrepreneurs, investors, policymakers and members of the general public to share ideas for improving how we eat and to develop connections and partnerships to advance that goal. It is evident that it is now much easier than just a few years ago to find local farmers from whom we source local and sustainable ingredients for our food businesses. FamilyFarmed deserves credit for the effort the organization puts into everything they do — especially their annual Good Food Festival & Conference — to provide a wide platform to all those who are connected to food, either by growing, distributing, selling or producing. Since our business opened last April, we were just a bit too late to participate in the 2015 Good Food Festival. This year, we are so glad to be a part of it and feature our business. SAAGE Culinary Studio helps each of the startup food businesses with whom we work to grow from our facility by providing them access to all the commercial grade equipment that they need to make their products. This is a tremendous financial help to all those food business owners, since they don’t have to increase their startup costs by investing a big sum of money to set up their own commercial space. 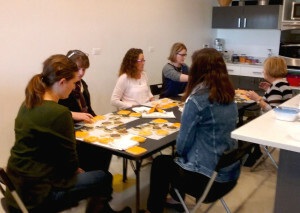 A class on decorating butter cookies at SAAGE Culinary Kitchen, which provided the photo. We help to create an environment in our facility in which each business owner can share their experiences with other business owners and form a network to strengthen each other. And with a relatively small investment, these food businesses can support themselves while helping the local economy to grow. Many of our kitchen clients work with individual local farms to obtain their raw ingredients, which helps the farmers as well. 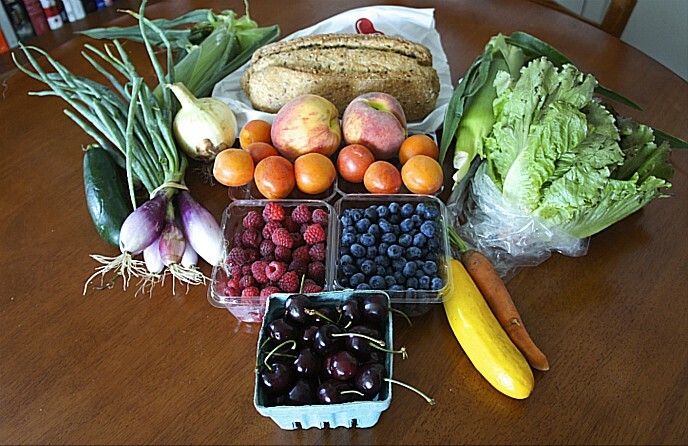 We are also starting a conversation with some local farms through Band of Farmers, the Chicagoland coalition of farmers who run Community Supported Agriculture (CSA) businesses that connect farmers to local communities. We are receiving a great response and we hope to use our space as a local CSA share dropoff and pickup location for the convenience of both the public and the farmers. We also try to emphasize educating the general public by offering nutrition classes in collaboration with local businesses. One such partner is Mary’s Wholesome Living. Mary Krystinak, the founder of the company, hosts cooking classes in our facility, teaching the once-lost but resurging art of food preservation. She brings in the knowledge of health-promoting preservation techniques such as fermentation, and demonstrates the making of kombucha, yogurt and kimchi. Mary’s Wholesome Living is one of four of our kitchen partners we will feature at this year’s Good Food Festival & Conference, and will present preserved foods that are made from scratch with no to very low added sugar and without any chemicals and preservatives. • Curry’s Kitchen, an Indian-inspired spice business with which I started my entrepreneurial journey in 2010. Curry’s produces a variety of spice blends, all made suitable for the American palate. At this year’s festival, we plan to launch our new products, Chai Tea Concentrate and slow-cooked Bone Broth with an Indian flavor. • Flour Power Cookies, which uses a variety of flours and spices to create wholesome treats to nourish your body and soul. They’ll be featuring their Better Day Bites — a vegan and gluten-free tender cookie with more protein and fiber than traditional cookies and less of a sugar crash — that has won over the taste buds of traditional cookie lovers. • 164 Brewing, whose founders are two very energetic young gentlemen who are doing wonders making their soda drinks. Their products are no ordinary sodas. They use traditional barrels for the aging process, just like making craft beer. Running SAAGE Culinary Studio has been such a blessing and it has given me ample opportunities to meet with a number of entrepreneurs and to learn a lot of things in that process. I am thankful every moment of my life for being able to help so many other small business owners and while doing so, contribute to the advancement of the Good Food movement as well. I would also like to take this opportunity to thank the Good Food Festival organizers for giving us this platform to feature some of our small food businesses. It will give all of us a perfect environment to meet with many other food vendors, customers and potential buyers. I am looking forward to having an exceptional experience in the festival at the UIC Forum on the University of Illinois at Chicago campus. I hope to see you at our booth in the Good Food Court on Saturday. We try to bring you the best of food, and without your support we cannot exist! This entry was posted in Community kitchens, Community Supported Agriculture, Craft beverages, CSAs, Food and community, Food and health, Food Artisans, Food education, Food Entrepreneurs, Good Food Festivals, Shared kitchens and tagged community kitchens, FamilyFarmed, Food Entrepreneurs, Good Food Festival & Conference, Good Food movement, Jim Slama, SAAGE Culinary Studio, Shared kitchens. Bookmark the permalink.